One of the reasons that the Walt Disney Company (for 95 years), has maintained a reputation of delivering a seamless "magical" experience to its guests in all of its operations is because Disney has a singular, cohesive overriding vision and mission for all of its business operations—from theme parks to hotels to restaurants to retail operations. "The mission of The Walt Disney Company is to be one of the world's leading producers and providers of entertainment and information. Using our portfolio of brands to differentiate our content, services, and consumer products, we seek to develop the most creative, innovative and profitable entertainment experiences and related products in the world." Walter Elias Disney (born in 1901) was an American entrepreneur, animator, voice actor and film producer. He was a pioneer of the American animation industry and introduced several developments in the production of cartoons, including the development of the character Mikey Mouse in 1928—his first highly popular success. He also provided the voice for his creations in the early years of his cartoon efforts, including the voice of Mickey Mouse. As a film producer, Walt Disney holds the record for most Academy Awards earned by an individual, having won 22 Oscars from 59 nominations. In the early 1920s and set up the Disney Brothers Studio with his brother Roy. In the 1950s, Disney expanded into the amusement park industry, and in 1955 he opened Disneyland, now called Disneyland Park. Disneyland was the first of two theme parks built at the Disneyland Resort in Anaheim, California. It is the only theme park designed and built under the direct supervision of Walt Disney. 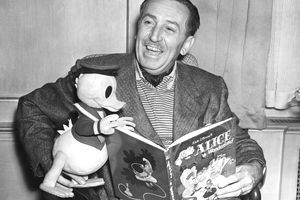 Walt Disney is well-known to the baby boomer generation because of his weekly Sunday night appearances on the Wonderful World of Disney, which first aired in October 1954. The highly popular show is unofficially the world's first infomercial. That's because it showcased the design, development, and progress of Disneyland theme park while the theme park was actually being built. Today, The Walt Disney Company, commonly known as Disney is an American diversified multinational mass media and entertainment conglomerate headquartered at the Walt Disney Studios in Burbank, California. It is the world's second-largest media conglomerate in terms of revenue, after Comcast, generating over $43 billion a year. The company also operated under the names The Walt Disney Studio and then Walt Disney Productions. Taking on its current name in 1986, it expanded its existing operations and also started divisions focused upon the theater, radio, music, publishing and online media. In addition, Disney has since created and acquired corporate divisions in order to market more mature content than is typically associated with its flagship family-oriented brands. The company is best known for the products of its film studio, Walt Disney Studios, which is today one of the largest and best-known studios in American cinema. Disney's other three main divisions are Walt Disney Parks, Experiences and Consumer Products, Disney Media Networks, and Disney Direct-to-Consumer and International. Disney also owns and operates the ABC broadcast television network; cable television networks such as Disney Channel, ESPN, A&E Networks, and Freeform; publishing, merchandising, music, and theater divisions; and owns and licenses Walt Disney Parks and Resorts, a group of 14 theme parks around the world. Mickey Mouse remains the signature mascot and emblem for Disney, and one of the world's most recognizable characters. On the evening of the new Millennial, ABC-TV wanted to welcome in 2000 by projecting the Mickey Mouse ears on the face of the moon but decided against it in the event that it was a cloudy night. The Possibilities of Geoengineering: a Remedy for Climate Change? What Is the Sharing Economy (and How Is it Changing Industries)? How Do Brick and Mortar Stores Compare with Online Retail Sites? Can Owners Get Tax Abatements and Credits for Small Business?